Shopping for Agents of SHIELD Pop! Vinyl Figures? Don't touch Lola, especially when Director Coulson is behind the wheel! The Agents of SHIELD Lola with Agent Coulson Pop! 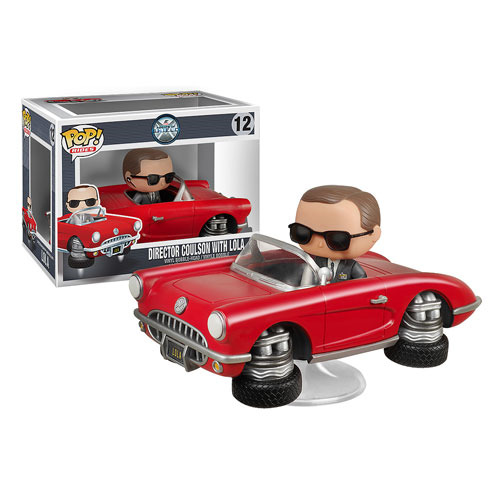 Vinyl Vehicle features the red 1962 Chevrolet Corvette convertible with flight capable (VTOL) wheels and a display base. Director Phil Coulson is cool as the other side of the pillow in his black shades, and black suit. Lola makes a great ride for other 3 3/4-inch Pop! Vinyls as well, but don't let Agent Coulson see it! Ages 3 and up.